I didn't mind seeing Biffle get the win this weekend. 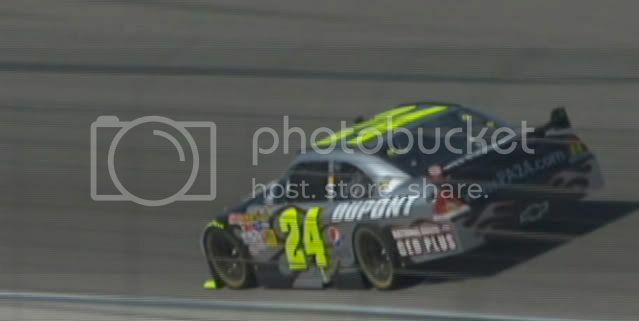 I just wish Jeff Gordon had had a better finish. If it wasn't for that near wreck at the very end, he would have been well inside the top ten. Good to see Kyle's bonus points vanish like a thief in the night. Jeff Gordon wins the pole in Dover today! 7th! What the Hello Kitty! Jeff Gordon wins at Texas!!! Joey Logano beats Kyle Busch for the win at Nashville. Nice to see someone else win in the Nationwide Series besides Kyle. Rough day in the pits for Jeff Gordon. They left a lug loose and went a lap down to finish 25th.